Taking a break from immigrant family stories, this week we’re featuring a new acquisition related to the Easter holiday. 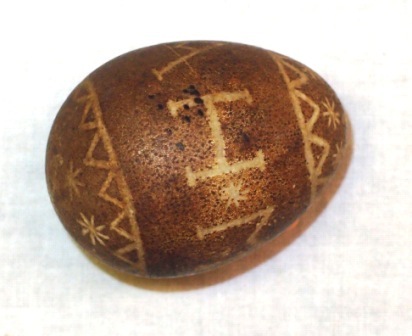 You may be familiar with the elaborate scratch-decorated eggs of the Lithuanian tradition; but did you know Pennsylvania Germans had a similar practice of scratch decoration? You can see many examples in a chapter on this topic in Alfred Shoemaker’s book Eastertide in Pennsylvania (1960). Often decorated eggs were made as presentation pieces or gifts from one friend to another at Easter. The MHC collection includes a few other decorated eggs, including a couple covered in fabric by Bessie Gottshall Kulp of Vernfield, Montgomery County, who demonstrated this technique at the Goschenhoppen Folk Festival. Here she is pictured in 1967 with an “egg tree” hung with her decorated eggs. Some recent scratch-carved eggs sit on the table. Photo from the Isaac Clarence Kulp Collection. Alfred Shoemaker also includes a chapter on the Easter egg tree tradition. The Winterthur Museum collection includes a drawing from around the same time, of not only decorated eggs but a yellow Osterhase (Easter bunny) leaping–perhaps in the joy of springtime–carrying a basket full of colorful eggs.